A number of years ago, the product team I was on spent a lot of team analyzing large log files. These log files contained thousands of lines of output tracing what the code was doing, what its current state was, and gobs of other diagnostic information. Typically, we were only interested in a handful of lines - but had no idea which ones at first. Often one would start by searching for a generic error message, get some information from that, search for some more specific information, obtain more context, and continue on in that manner until the problem was identified. It was usually the case that interesting lines were spread across the entire file and could only really be understood when viewed together - but gathering them all could be inconvenient. Different people had different tricks and tools to make different aspects of the search more efficient, but nothing really addressed the end-to-end scenario and I decided I'd try to come up with something better. TextAnalysisTool was first released to coworkers in July of 2000 as a native C++ application written from scratch. It went through a few revisions over the next year and a half and served myself and others well during that time. Later, as the .NET Framework became popular, I decided it would be a good learning exercise to rewrite TextAnalysisTool to run on .NET as a way to learn the Framework and make some architectural improvements to the application. TextAnalysisTool.NET was released in February of 2003 as a fully managed .NET 1.0 C# application with the same functionality of the C++ application it replaced. TextAnalysisTool.NET has gone through a few revisions since then and has slowly made its way across parts of the company. (It's always neat to get an email from someone in a group I had no idea was using TextAnalysisTool.NET!) TextAnalysisTool.NET is popular enough among its users that I started getting requests to make it available outside the company so that customers could use it to help with investigations. The effort of getting something posted to Microsoft.com seemed overwhelming at the time, so TextAnalysisTool.NET stayed internal until now. With the latest request, I realized my blog would be a great way to help internal groups and customers by making TextAnalysisTool.NET available to the public! You can download the latest version of TextAnalysisTool.NET by clicking here (or on the image above). In the above demonstration of identifying the errors and warnings from sample build output, note how the use of regular expression text filters and selective hiding of surrounding content make it easy to zoom in on the interesting parts of the file - and then zoom out to get context. Additional information can be found in the TextAnalysisTool.NET.txt file that's included in the ZIP download (or from within the application via Help | Documentation). The first section of that file is a tutorial and the second section gives a more detailed overview of TextAnalysisTool.NET (excerpted below). The download also includes a ReadMe.txt with release notes and a few other things worth reading. The Problem: For those times when you have to analyze a large amount of textual data, picking out the relevant line(s) of interest can be quite difficult. Standard text editors usually provide a generic "find" function, but the limitations of that simple approach quickly become apparent (e.g., when it is necessary to compare two or more widely separated lines). Some more sophisticated editors do better by allowing you to "bookmark" lines of interest; this can be a big help, but is often not enough. The Solution: TextAnalysisTool.NET - a program designed from the start to excel at viewing, searching, and navigating large files quickly and efficiently. TextAnalysisTool.NET provides a view of the file that you can easily manipulate (through the use of various filters) to display exactly the information you need - as you need it. Filters: Before displaying the lines of a file, TextAnalysisTool.NET passes the lines of that file through a set of user-defined filters, dimming or hiding all lines that do not satisfy any of the filters. Filters can select only the lines that contain a sub-string, those that have been marked with a particular marker type, or those that match a regular expression. A color can be associated with each filter so lines matching a particular filter stand out and so lines matching different filters can be easily distinguished. In addition to the normal "including" filters that isolate lines of text you DO want to see, there are also "excluding" filters that can be used to suppress lines you do NOT want to see. Excluding filters are configured just like including filters but are processed afterward and remove all matching lines from the set. Excluding filters allow you to easily refine your search even further. Markers: Markers are another way that TextAnalysisTool.NET makes it easy to navigate a file; you can mark any line with one or more of eight different marker types. Once lines have been marked, you can quickly navigate between similarly marked lines - or add a "marked by" filter to view only those lines. Find: TextAnalysisTool.NET also provides a flexible "find" function that allows you to search for text anywhere within a file. This text can be a literal string or a regular expression, so it's easy to find a specific line. If you decide to turn a find string into a filter, the history feature of both dialogs makes it easy. Summary: TextAnalysisTool.NET was written with speed and ease of use in mind throughout. It saves you time by allowing you to save and load filter sets; it lets you import text by opening a file, dragging-and-dropping a file or text from another application, or by pasting text from the clipboard; and it allows you to share the results of your filters by copying lines to the clipboard or by saving the current lines to a file. TextAnalysisTool.NET supports files encoded with ANSI, UTF-8, Unicode, and big-endian Unicode and is designed to handle large files efficiently. I maintain a TODO list with a variety of user requests, but I thought I'd see what kind of feedback I got from releasing TextAnalysisTool.NET to the public before I decide where to go with the next release. I welcome suggestions - and problem reports - so please share them with me if you've got any! I hope you find TextAnalysisTool.NET useful as I have! The 10606 release of the AJAX Control Toolkit introduced ToolkitScriptManager, a new class that extends the ASP.NET AJAX ScriptManager to perform automatic script combining. I blogged an overview of ToolkitScriptManager last week (including an explanation of what "script combining" is). This post will build on that overview to discuss some of the changes to ToolkitScriptManager in the 10618 release of the Toolkit. The most obvious change is the addition of an optional new property: CombineScriptsHandlerUrl. Left unset, ToolkitScriptManager works just like before; setting CombineScriptsHandlerUrl specifies the URL of an IHttpHandler (feel free to use @ WebHandler to implement it) that's used to serve the combined script files for that ToolkitScriptManager instance instead of piggybacking them on the host page itself. Implementing this handler is simple: just use the CombineScriptsHandler.ashx file that's part of the SampleWebSite that comes with the Toolkit! :) If you look at how that handler works, the ProcessRequest method simply calls through to the ToolkitScriptManager.OutputCombinedScriptFile(HttpContext context) method which is public and static for exactly this purpose. OutputCombinedScriptFile does all the work of generating the combined script file and outputting it via the supplied HttpContext - in fact, this is the same method that ToolkitScriptManager now uses internally to output a piggybacked combined script file. Because adding a handler in this manner doesn't require modifying the server configuration, CombineScriptsHandlerUrl can also be used by people in hosted and/or partial trust scenarios. Using CombineScriptsHandlerUrl incurs no unnecessary load on the server. One of the tradeoffs of the piggyback method for generating combined script files is that it involves a little bit of extra processing as part of the host page's page lifecycle that's not strictly necessary for the purposes of generating the combined script file. ToolkitScriptManager manages the page lifecycle processing to minimize the impact of piggybacking, but can't eliminate it all. However, using CombineScriptsHandlerUrl with a dedicated IHttpHandler doesn't involve any such overhead and helps keep things as efficient and streamlined as possible. The host page doesn't get reinvoked and the dedicated IHttpHandler does no more than it needs to. Using CombineScriptsHandlerUrl won't interfere with URL rewriting. Customers using URL rewriting with their web sites pointed out that the piggybacking approach to combined script generation might require them to revise their URL rewriting rules to account for the unexpected page requests with the special combined script request parameter. ToolkitScriptManager tries to be as easy to use as possible, so one of the nice things about setting the new CombineScriptsHandlerUrl property is that web site authors can choose whatever URL works best for them to be their combined script file handler, thereby avoiding conflict with existing URL rewriting rules. Using CombineScriptsHandlerUrl makes it more likely that cached script files will be reused. When piggybacking combined script URLs, the presence of the host page's base URL in the combined script URL means that any cached script files generated by page A will not be usable by page B (which has a different base URL). Of course, once the user's browser caches the combined script files for pages A and B, the cached versions will be used and there is no server impact - but page B won't benefit from page A's cached file even if the combined script files are otherwise identical. When pages A and B both use the same set of extenders and CombineScriptsHandlerUrl is specified, the combined script file URL generated by pages A and B will be identical (because the combined script file handler base URL will be the same for both) and therefore the combined script file cached by the user's browser for page A will be automatically used for page B as well. For web sites with common extender usage patterns (such as a TextBoxWatermark'd search box in the corner of every page), the caching benefits of CombineScriptsHandlerUrl could be significant. The CurrentUICulture is now embedded in the combined script URL so that changing the browser's culture while viewing a site will properly update the culture of the site's extenders. ToolkitScriptManager's check for a script's eligibility to participate in script combining now includes a check for the WebResource attribute which is one of the things that ASP.NET's ScriptResourceHandler requires in order to serve an embedded resource. Consequently, an assembly's embedded resources without a corresponding WebResource attribute are no longer eligible for script combining (without needing to use the ExcludeScripts to explicitly remove them). This makes ToolkitScriptManager's behavior more consistent with that of ScriptResourceHandler. If you're already using ToolkitScriptManager and want to start using CombineScriptsHandlerUrl, but don't want to have to modify a bunch of ASPX pages to add the new property, you can take advantage of the fact that ToolkitScriptManager is now decorated with the Themeable attribute and can be customized by a .skin file as part of ASP.NET's Theme/Skin support. Adding CombineScriptsHandlerUrl to all the pages of the Toolkit's SampleWebSite was easy - I just added a ToolkitScriptManager.skin file to the existing web site theme and used the code <ajaxToolkit:ToolkitScriptManager runat="server" CombineScriptsHandlerUrl="~/CombineScriptsHandler.ashx" /> to set CombineScriptsHandlerUrl for the entire site. ToolkitScriptManager is a handy way to enhance a web site with the AJAX Control Toolkit and it's gotten even better with the 10618 release of the Toolkit. We think ToolkitScriptManager offers some pretty compelling enhancements and we use it for all the AJAX Control Toolkit's sample content. We encourage anyone who's interested to give ToolkitScriptManager a try and see how well it works for them. As always, if there are any problems, please let us know by posting a detailed description of the problem to the AJAX Control Toolkit support forum. A short while ago we made available the 10618 release of the AJAX Control Toolkit. This release addresses a handful of user-impacting issues introduced by changes in the recent 10606 release and identified by the user community in the support forum and online issue tracker. Significant changes always have the risk of introducing problems so we do our best to find and fix them all before releasing. But for things that manage to sneak through, a targeted follow-up release is often a good way to fix annoyances quickly. Tabs: Resolved NamingContainer issues so that FindControl works as expected in Tabs. ToolkitScriptManager: Shorter combined script URLs and new HTTP handler support for generation of combined script files. Dependencies: Removed explicit reference to VsWebSite.Interop.dll and stdole.dll. They will not be automatically included in the web configuration files by Visual Studio. FilteredTextBox: Navigation, Control and Delete keys work fine in all browsers. Localization: Turkish, Dutch, and Traditional and Simplified Chinese language support added. As always, it's easy to sample any of the controls right now (no install required). You can also browse the project web site, download the latest Toolkit, and start creating your own controls and/or contributing to the project! If you have any feedback, please share it with us on the support forum! PS - Last week I blogged an overview of the ToolkitScriptManager introduced in the 10606 release. ToolkitScriptManager has gotten even better in this release, and I'll be writing more about it later this week! Note: Recent versions of ASP.NET AJAX include the ScriptManager.CompositeScript property which performs much the same functionality as discussed here. More information is available in the article Combining Client Scripts into a Composite Script. The 10606 release of the AJAX Control Toolkit includes ToolkitScriptManager, a new class that derives from the ASP.NET AJAX ScriptManager and performs automatic script combining. What is meant by "script combining" and why is it desirable? Script combining is beneficial because fewer JS files means fewer request/response operations by the browser - which translates directly into quicker page load times for users and less load on the web server. Furthermore, there will be less network traffic because the HTTP headers associated with each unnecessary request/response operation don't need to be transmitted (saving around 750 bytes for each combined script). At the extreme, one could combine all (~40) the Behaviors in the Toolkit into a single, monolithic JS file (either manually or as part of the build process) and always send that file to the browser. While there are certain benefits to this, we chose not to do so for two main reasons: 1) the ASP.NET AJAX framework the Toolkit builds upon is an object-oriented framework and it's beneficial to maintain the mental/physical separation that comes from keeping each behavior isolated and 2) any page that used any part of the Toolkit would be forced to download the entire set of scripts in the Toolkit. ToolkitScriptManager gives us the best of both worlds by combining exactly the relevant JS files used by each page into one file so the browser downloads only what's necessary for each page. ToolkitScriptManager's script combining is more than a simple concatenation of all the script files in the Toolkit; it's a dynamic merge of only the scripts that are actually being used by a page each time it's loaded by the browser. If a page has an ASP.NET AJAX UpdatePanel on it and additional scripts need to be sent as part of an async postback, then ToolkitScriptManager will automatically generate a combined script file containing only those scripts that the browser hasn't already downloaded. ToolkitScriptManager automatically compresses the combined script file if the browser indicates it supports compression - achieving slightly better compression in the process because most adaptive dictionary-based compression techniques (like HTTP's GZIP and Deflate) tend to compress data better in one chunk than in multiple chunks (because the dictionary doesn't keep getting reset). The combined script file is cached and reused by the browser just like the corresponding script files would have been if ToolkitScriptManager weren't being used. Basically, script combining effortlessly creates faster loading web pages - and happier users by extension! Simple: Just replace <asp:ScriptManager ... /> with <ajaxToolkit:ToolkitScriptManager ... /> in your ASPX page and you're done! (Of course, if you're not using the default namespaces "asp" and "ajaxToolkit", you'll need to substitute your own namespaces.) The scripts in the AJAX Control Toolkit are already enabled for combining, so it's really that easy! How do I enable combining for my custom Behavior's scripts? Script combining is a two-stage process. The first stage takes place during the normal ASP.NET page lifecycle when ToolkitScriptManager overrides ScriptManager's OnLoad method to initialize its state and its OnResolveScriptReference method to find out when script references are being resolved. The initialization code in OnLoad consists of adding a HiddenField to the page and using it to track which scripts have already been loaded by the browser. The handling of OnResolveScriptReferences is a little more involved: the script reference is checked for combinability (i.e., does the assembly's ScriptCombine attribute allow the script to take part in script combining) and the script reference is changed to point to the URL of a combined script file. In this manner, all scripts that are part of the same combined script file get the same URL and the ScriptManager class outputs that URL to the page exactly once. Notably, because scripts may have a strict ordering, the presence of an uncombinable script in the middle of combinable scripts will result in two combined script files being generated (the first consisting of the scripts coming before the uncombinable script and the second consisting of the scripts after it). The URL of the combined script file is currently of the form: .../Page.aspx?_scriptcombiner_=;Assembly1.dll Version=1:MVID1:Script.Name.1.js:Script.Name.2.js;Assembly2.dll Version=2:MVID1:Script.Name.3.js. What this means is that the ASPX page itself is referenced with the special request parameter "_scriptcombiner_" and a semicolon-delimited list of assemblies with a colon-delimited list of the required scripts from each of them. The strong name of the assembly is used to avoid potential confusion if multiple versions of an assembly are present and the ModuleVersionID (MVID) is used to ensure that any changes to the assembly itself automatically invalidate all combined script files that reference it. In this manner, recompiling one of the assemblies contributing to a combined script file will cause the new scripts to be downloaded by the browser next time the page is loaded. The second stage of script combining takes place when the page is referenced with the "_scriptcombiner_" request parameter. ToolkitScriptManager overrides OnInit (one of the first parts of the page lifecycle) and uses that opportunity to generate the combined script file based on the value of the request parameter, outputs the combined script file to the browser, and stops further processing of the page lifecycle. Of note, the cache settings of the combined script file are set to the same values that the individual script files would have had if ToolkitScriptManager weren't being used and the combined script file is automatically compressed according to the browser's wishes. Similarly, any localized script resources for a script file that is in the process of being combined are loaded and sent to the browser as part of the combined script file. After all combined scripts are output, ToolkitScriptManager appends a small bit of script to the end of the file to update the page's HiddenField with the scripts that have just been added. In this manner, any additional scripts added during an async postback are automatically tracked by the page and subsequent async postbacks will know exactly which scripts have already been loaded by the browser. ScriptManager uses ScriptResourceHandler (an IHttpHandler) to serve (uncombined) scripts, so it's natural to wonder why ToolkitScriptManager wouldn't do the same. The reason is that the AjaxControlToolkit DLL is often run in partial trust scenarios where it couldn't add such a handler to the system itself - and because we don't want people to have to modify their web.config file just to enable script combining. By making use of the same page for serving combined script files, ToolkitScriptManager offers a seamless experience that's simple to configure, simple to manage, and that works even for folks who don't have control over the web server that's hosting their content. Are there any tradeoffs when switching to ToolkitScriptManager? There are no significant tradeoffs that we know of, but there are a couple of implications it's good to be aware of. For one, the current combined script URL format is currently pretty verbose and can lead to unusually long URLs. While this hasn't been a problem so far, it will be easy to change the format in the future (with no impact to users) and we're already considering ways of doing so. Another thing to be aware of is that reusing the page to serve the combined script file means that there is some additional server processing that happens before/during the OnInit stage of the page lifecycle when processing a combined script file. (Though the additional work here is offset by the savings of not having to serve multiple JS files.) Again, this hasn't been an issue, but it's something to keep in mind if things behave differently after adding ToolkitScriptManager to a page. So just how risky is it to switch to ToolkitScriptManager? That's a loaded question [ :) ], but it's informative to note that all AJAX Control Toolkit sample pages (including the sample web site, automated tests, manual tests, etc.) have been converted over to use ToolkitScriptManager with only one issue: The Slider's SliderBehavior.js script uses a fairly obscure feature enabled by the PerformSubstitution property of the WebResource attribute that allows <%= WebResource/ScriptResource %> tags to be embedded in JS files and get resolved before the script is sent to the browser. This behavior isn't currently supported by ToolkitScriptManager (it will throw an informative Exception if it detects the presence of this construct), so the ExcludeScripts property of the ScriptCombine attribute on the AjaxControlToolkit DLL has been used to exclude the SliderBehavior.js file from being combined. ToolkitScriptManager works seamlessly in every page of the AJAX Control Toolkit, so we encourage folks to give it a try if they're interested in the benefits it offers! As always, if you encounter any problems, please let us know by posting a detailed description of the problem to the AJAX Control Toolkit support forum. Earlier today we made available the 10606 release of the AJAX Control Toolkit. This release focused on addressing many of the most popular bugs and work items identified by the user community in the support forum and online issue tracker. We've also added some new functionality to the Toolkit that really improves the user experience for page authors and consumers alike! Tabs designer: Tabs control can be configured in the designer. PageMethods in code-behind: Extenders that consume web services can now have PageMethods added to code-behind automatically when using the designer. A repair mode fixes existing PageMethods with incorrect signatures. Control icons: Toolkit controls have more meaningful icons that show up in the Visual Studio Toolbox when the Toolkit DLL is added to it. Dynamic context: Toolkit extenders that consume web services can now pass additional context beyond what is used by the default web service signature. Validators and Toolkit extenders: Extenders that target TextBoxes with ASP.NET validators attached to them no longer interfere with the validation process. Animation support: Toolkit controls that build on top of PopupBehavior now have generic animation support built in. Events support: Toolkit controls fire events for core actions. This is in part to make plugging in animation easier and also to allow users to hook into the various Toolkit controls' behaviors and perform custom actions. Bug fixes: This release includes fixes for over 120 issues tracked in the Toolkit Issue Tracker representing over 750 user votes. Accessibility fixes: Slider and AutoComplete have support for high contrast and some controls like AutoComplete, NumericUpDown, CascadingDropDown and DynamicPopulate which issue XmlHttpRequests update a hidden DOM element to automatically refresh the JAWS screen buffer to reflect new data. MaskedEdit extender works well with the Calendar extender and the ValidatorCallout extender when targeting the same TextBox. AutoComplete supports scrolling in the fly-out, multi-word, first word default selection and it has animation built into it. ModalPopup fix for most common scenarios involving absolute and relative positioning. NumericUpDown has new Minimum and Maximum properties to restrict the range of numbers allowed. The Toolkit DLL works with ASP.NET AJAX Orcas Beta 1 DLLs and there are no breaking changes. For more details about the Tabs designer, web service design-time enhancements, and script combining (along with some pretty pictures! ), check out Shawn Burke's release announcement. PS - The public sample site hasn't been deployed quite yet (real soon now! ), but the new Toolkit bits are up on CodePlex, so feel free to get them and start using them! Yesterday, Microsoft announced its Surface product to much buzz and excitement. The demo videos I saw featured a "photos on a table" user interface that displayed a handful of photos sitting on the Surface. The interface allowed people to easily move the virtual photos around by touching them in the center and sliding them to a different location on the screen. By touching the corners instead, photos could be sized and rotated with ease. When the application loads, it randomly lays out the sample photos. To interact with a photo, simply move the mouse pointer over the photo and click+drag on one of the yellow control elements that appears. The center element moves the photo around and the corner elements all rotate/resize it. Click on any part of a photo to bring it to the top of the pile. Without the snazzy Surface hardware support, this application doesn't support the Human Finger 1.0 input device. :) However, if you run it on a Tablet PC or hooked up to something like the Wacom Cintiq, you can get pretty close. As expected, Silverlight's XAML support makes this kind of interface pretty easy to build. I understand the Surface UI was written using WPF (Silverlight's big brother), so I suspect some of the techniques they used are fairly similar to what's being done here. 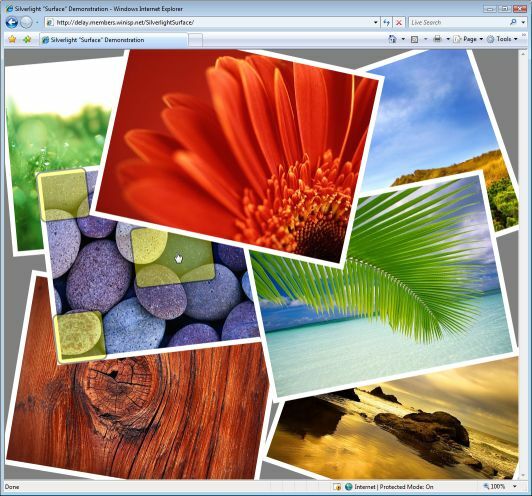 The sample images are a few of my favorite wallpapers that come with Windows Vista. I have not included them with the code download because they're large and it's easy enough to copy them from your own %windir%\Web\Wallpaper directory. Or just use your own favorite images! It's pretty obvious that XAML lets you do some pretty neat things with ease - I look forward to even more compelling new interfaces based on Silverlight and WPF!